In the immediate aftermath of a SportsbyBrooks.com exclusive report uncovering the connection between Silicon Valley venture capitalist Christopher Schaepe and college admissions scandal kingpin Rick Singer, Connie Loizos of Techcrunch.com reported today that Schaepe is out at the firm he co-founded 19 years ago, Lightspeed Venture Partners. 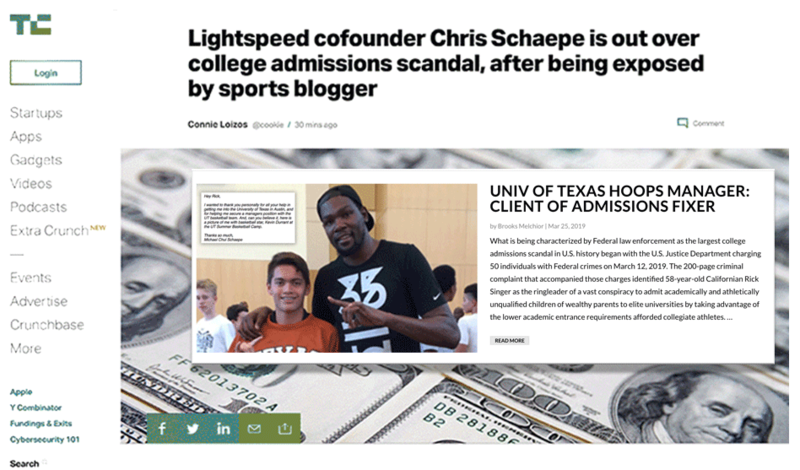 Sources say that soon after the admissions scandal broke, Schaepe hired a lawyer, then told Lightspeed, which made the decision to part ways with him. But seemingly, a sports blogger named Brooks Melchior played his own role in the news and why it burst into public view today. 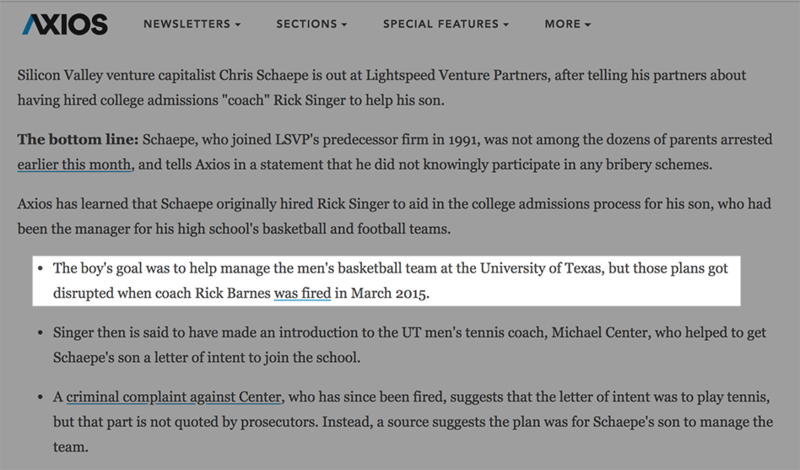 The Axios story covering Schaepe’s ouster at Lightspeed also added a new, anonymously-sourced piece to the college admissions scandal puzzle: ex-Texas and current Tennessee head basketball coach Rick Barnes. Axios has learned that Schaepe originally hired Rick Singer to aid in the college admissions process for his son, who had been the manager for his high school’s basketball and football teams. 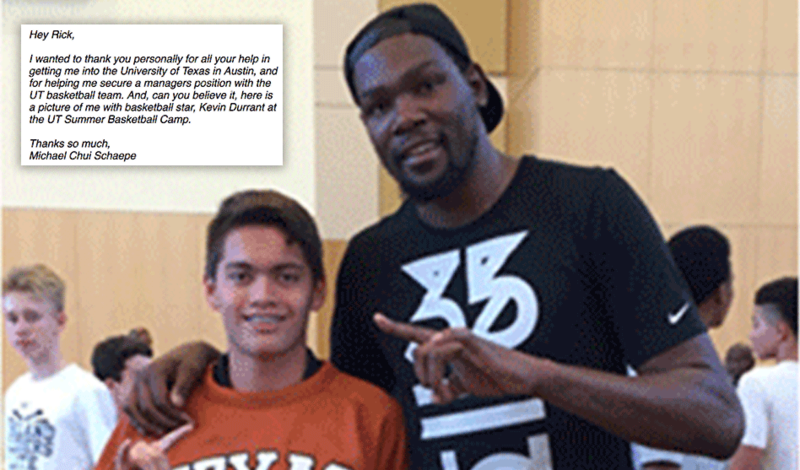 The boy’s goal was to help manage the men’s basketball team at the University of Texas, but those plans got disrupted when coach Rick Barnes was fired in March 2015. Singer then is said to have made an introduction to the UT men’s tennis coach, Michael Center, who helped to get Schaepe’s son a letter of intent to join the school. A criminal complaint against Center, who has since been fired, suggests that the letter of intent was to play tennis, but that part is not quoted by prosecutors. Instead, a source suggests the plan was for Schaepe’s son to manage the team. But the Federal complaint involving Schaepe, his son and the University of Texas only mentions how UT Tennis Coach Michael Center assisted Singer in providing Chiu-Schaepe admittance into the school. 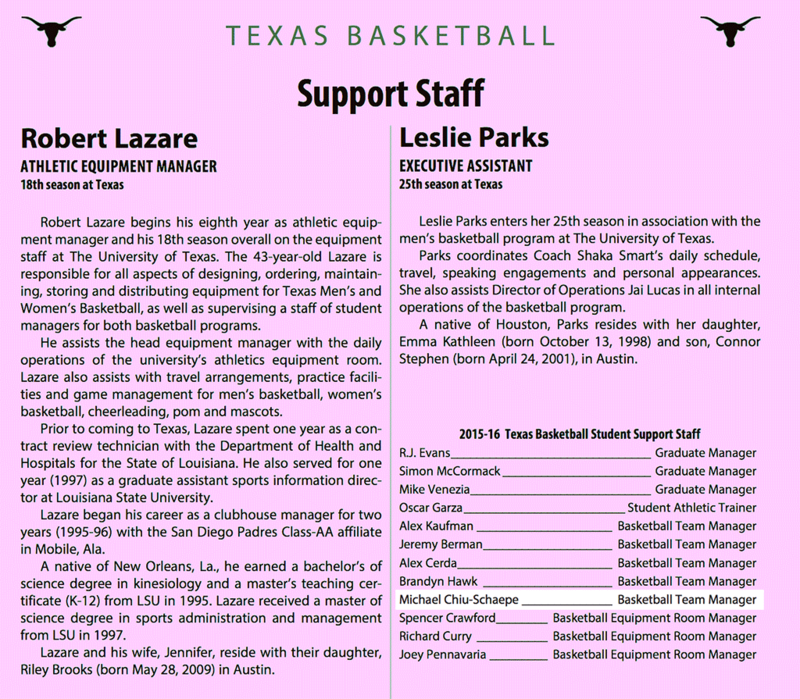 The addition of the firing of Rick Barnes in 2015 goes a long way to explaining why Michael Chiu-Schaepe’s role with the Texas basketball team wasn’t mentioned in the Federal complaint documenting the alleged crimes of Texas tennis coach Michael Center and why Chiu-Schaepe’s testimonial on Singer’s website doesn’t mention tennis. 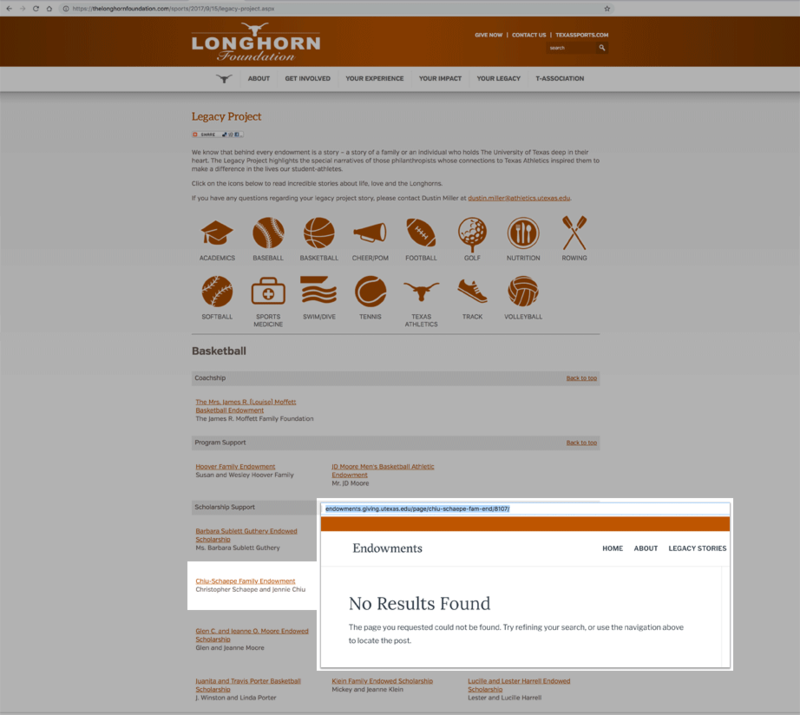 It also suggests that Barnes and/or a representative of the Texas basketball program may have played a role in Chiu-Schaepe’s acceptance into the University of Texas – which may also be related to the University of Texas “Longhorn Foundation” website crediting the “Chiu-Schaepe Family Endowment” with providing “scholarship support” for the Texas basketball program, though the page linked to the family name is blank. As reported by SportsbyBrooks.com last week, the Chiu-Schaepe family is also listed by the University of Texas as having made a $100,000 donation to UT’s Moody College of Communication. 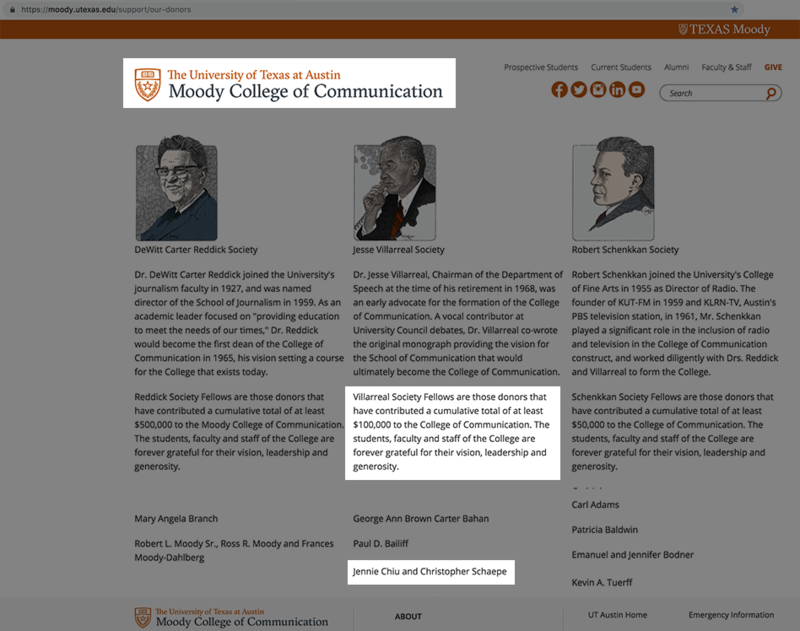 The fact that the University of Texas is still crediting Christopher Schaepe with having made a donation to the school’s basketball program while recording on another of its websites that Schaepe and his wife are $100,000 donors to UT’s Moody College of Communication and that Singer’s plan for Chiu-Schaepe getting in to Texas originally included the cooperation of Rick Barnes – with Chiu-Schaepe listed as a manager for the team that season – all but confirms that the criminal activities that got a University of Texas employee arrested by the Feds was not an isolated incident involving a single UT tennis coach.